In addition to offering a fecund breeding ground for longform storytelling, one of the distinct advantages television has over film is the chance for course correction. As the latter episodes of most seasons are still being produced while the series airs, the notion of readjustment can sometimes become a valuable option. And yet that is something Netflix's all-at-once model does not allow for, as it requires an entire season to be in the can before a single episode reaches the hungry eyes of the streaming service's many subscribers. Interestingly enough, this is the same model used by HBO, even though it still schedules its seasons to air over the course of eight to ten weeks. It is uncertain whether Narcos, Netflix's mostly drugless drug saga attempted to correct course at any part during its occasionally dry but nonetheless addictive first season. But it is telling that, during the season 1 finale, the absence of the defining yet divisive element – in this case, the pervasive voiceover narration – demonstrably improves the overall dramatic impact of the episode. Which is precisely what happens when Boyd Holbrook's Steve Murphy is abducted during the opening sequence, resulting in the temporary silencing of the show's narrator. The intent behind Murphy's disappearance is simple: it alters the familiar episodic structure in such a way the natural tension of a finale is intensified. And that's a plus, because there's no real tension in Murphy's abduction – the character is speaking in the past tense, so the stakes are never going to be that high. Still, the dynamic of the show is distorted enough that viewers are left as rudderless as the characters scrambling to find the missing DEA agent. And the question of how things are going to play out become paramount, as the audience is ostensibly is asked for the first time to navigate entire dramatic sequences without the help of the guide who's been around for the past nine hours. It is actually a fairly shrewd trick for Chris Brancato and the other writers to employ – removing a constant as a means of subverting the format to benefit the dramatic intensity of a single episode. In this case, however, there is another benefit, especially for those who prefer their television series not also double as an audiobook on the history of Colombian drug lord Pablo Escobar. Holbrook's temporary absence gives the show a chance to breathe, for scenes to develop of their own volition. And in the case of terrific actors, like Pedro Pascal, Wagner Moura, Manolo Cardona, and Raúl Méndez, the dearth of DEA Agent Steve Murphy's ubiquitous voiceover means they are finally afforded an opportunity to carry scenes from start to finish, instead of batting cleanup for the show's all-knowing mouthpiece. It is in these moments that 'Despegue' actively demonstrates what is working for Narcos, what the show does well almost inherently, and how the series is in a position to become more than just a chronicle of history, if it can relieve itself of one burdensome crutch. Like the rest of the season, Moura is in top form as Escobar during the finale. The actor has managed to take what is essentially a one-note sociopath and given him tremendous onscreen depth. Moura plants his Escobar firmly in the intersection of power-hungry madman and petulant child who doesn't understand why his invitation to the club never came. His face is often a mixture of sadness and rage, a scowl on the verge of revealing just how deeply he feels the sting of rejection. That half-hurt, half-angry face winds up being a powerful tool for Moura when he finds himself face-to-face with Vice Minister of Justice Eduardo Sandoval (Cardona), and drops something along the lines of "I could have been you" to his hostage. Again, it's important to note this exchange unfolds entirely between the two actors who are noticeably free of Holbrook's omniscient chaperoning. The result works much like the scenes featuring Méndez as Colombian President Cesar Gaviria, who is saddled with the task of poking the sort of bomb-planting bear Escobar has become. All three actors must steer themselves (and one another) through a series of emotions, with increasingly difficult decisions to be made. When Méndez is afforded the opportunity to portray Gaviria sitting in silence, contemplating the familiar compromising situation he and his country are in, his silence in that moment resonates far louder than any firearm, and it says far more than any voiceover could. Moura and Cardona find themselves in a wordier situation, as their interplay becomes some of the best of the series, and makes one wish the same opportunity could be granted Pascal and Holbrook. While they all have the benefit of history to draw from, this small section of Narcos' 10-hour run is arguably the most compelling dramatic work of the series so far. That leaves 'Despegue' in an interesting predicament; as it must bring Murphy back, and in doing so, answer the question of where he's been and how it is he survived. That means a requisite flashback to Pacho Herrera (Alberto Ammann) blackmailing him with evidence of civilian casualties during the raid that killed Poison and led to Murphy's facile proclamation of being a good person doing bad things (where have we heard that before, Netflix?). There's intrigue in the blackmail attempt, though it's ultimately cut short by an over-telegraphed moment when the likely suspect coincidentally walks by just as Peña and Murphy ask, "Who could it be?" But that's the world Narcos has created for itself: a world that is often times more interested in mechanically unpacking the historical beats of a legend than it is in digging for insight into who its characters really are. To its credit, that is the world the show seems most comfortable living in – which is why the season finds success in ending on an eerie image of Escobar escaping into the night. And despite evidence of potential success outside its very particular microcosm (i.e., Murphy's brain), at least this series knows where it wants to be. 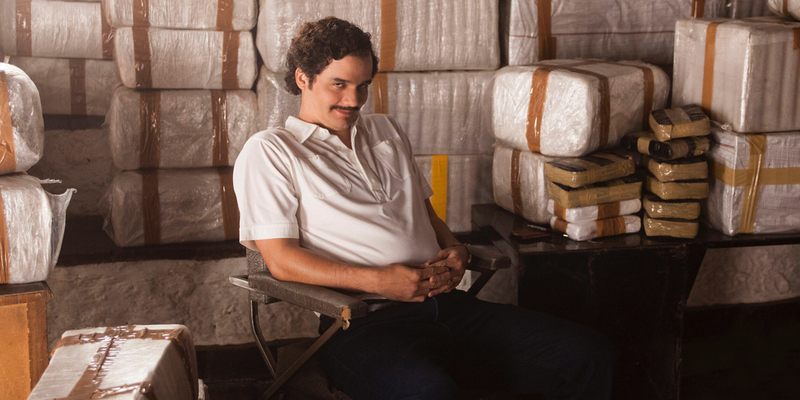 Narcos season 1 is currently available in its entirety on Netflix.